With the 2014 International Cup now just hours away players from all teams are just itching to get out on the fields in and around Melbourne to show their skills and seek rewards for their efforts. The Chinese team is certainly out to make a mockery of their 15th seeding and are keen to pull off upsets galore. Below is the Chinese squad, featuring names and their team local team. The team will be captained by Shaoling Chen from the Guangzhou Scorpions. 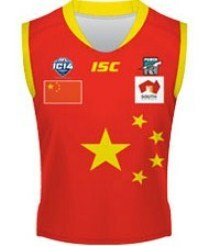 He is part of a group of 23 Scorpions in the squad, along with one from the Beijing Bombers, one from the Dongguan Giants, four from the Southern Dragons and two from La Trobe.